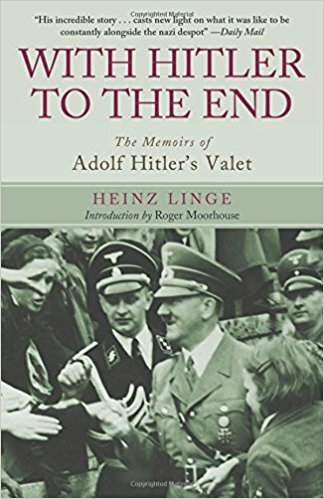 Heinz Linge recounts a riveting and detailed narrative of day to day life with Adolf Hitler. As a member of Hitler's personal staff, he was one of the few who was with him nearly every single day for many years, thus he offers a unique perspective into the man, Adolf Hitler. Linge shares little details about the dictator such as his love for his dog, Blondi, which really brings out the human side of Hitler. With Hitler to the End is well written and is an easy read. Although one thing which was just a bit confusing to me was that while for the most part, the narrative is told chronologically, on several occasions, Linge drops in an anecdote which is out of sequence. Also, I was a bit surprised by his obvious admiration of Hitler even decades after the events, knowing the full scope of what Hitler was responsible for; which he insists he had no knowledge of at the time of his service to the dictator. Linge also claims that he was personally apolitical and had never even read Mein Kampf. The most surprising thing to me, and that which left the biggest impression on my mind, is Hitler's staunch belief that he was acting under the direction of Providence. This conviction was apparently not simply propaganda to instill confidence in the German people, but according to Linge, these sentiments were oft expressed by Hitler behind closed doors in conversations with only his closest circle of confidantes; Linge included. I found it so fascinating, and frankly, chilling, that one could be perpetrating some of the most heinous acts in history and yet still believe that they are doing what is right. Linge writes very matter-of-factly about everything (he does not address the concentration camps or the like except to denounce any knowledge of them) and in an almost conversational tone which is very easy to follow and which makes his account very believable. Several times he refutes claims and disputes facts made by others who were close to Hitler, insisting that he was at Hitler's side day and night for over a decade and therefore observed more than others and knew the dictator more closely than anyone other than Eva Braun (Hitler's longtime mistress). Whether or not his version of the facts is indeed accurate we will probably never know. Even though I knew beforehand how the story ends I found myself so engrossed in the book during the latter pages that I couldn't put it down until I'd finished. The details of the final days in the bunker are so gripping, and even heartbreaking in the case of an incident with the children of one of Hitler's ministers, that you can almost feel the tension that Linge describes. Through this book, you get an inside look at the victories and defeats of the Third Reich as Linge recounts visits to the front, meetings with Mussolini, confidential strategy meetings with top military and Nazi Party officials and even more mundane things such as Hitler's failing health, his diet and seating preferences at dinners. I think Linge's remark that "I had a theatre-box on history, and remained in it until it collapsed..." is an accurate sentiment that reflects the tone of the book. I think those interested in history, especially World War II history, will find With Hitler to the End to be a worthwhile read. NOTE: There are a couple instances of strong language when Linge cites a direct quotation and there are occasions where he recalls examples of a crass line of questioning that the Russians put him through during his imprisonment. Because of these examples and the general subject matter of this story, I recommend this book for adults only.